Affordable Disposal of Your Old Computers, Monitors, Printers, etc. Call Us Now For a Free Quote on Solving Your E-Waste Problem! Got Old Office Equipment to Remove? Same-Day Rubbish Removal has been operating in Sydney’s junk removal industry for over a decade now, and in these years we’ve witnessed huge change. One the big changes we’ve noticed is the increased amount of e-waste that is being disposed of. Our team love technology and all the conveniences that it brings, however, it makes us sad to see so much of it go to waste. 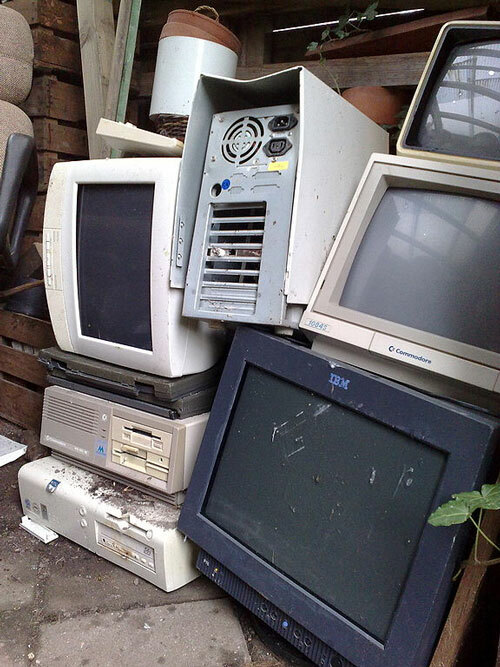 Common items that we see being disposed of include computers, monitors, printers and faxes. Many of these are less than 5 years old and looks as though they’d work alright after minor repairs. The majority of people would be sad to be throwing out a lot of this equipment, as they’ve obviously spent good money on it at some point and they generally don’t like disposing large amounts of waste. However, often it seems to be cheaper to replace an item than to have it repaired. Printers are a classic case where it can be cheaper to buy a whole new printer than to buy ink replacements. There are often things that can be done to extend the life of your technology, but eventually it will break or become redundant. When this happens, call Same-Day Rubbish Removal on 0402 737 046, we’ll have your junk gone in no time! At Same-Day Rubbish Removal, we do everything we can to ensure that your junk is disposed of in the most responsible way possible. This means that wherever possible, we’ll make sure that items are recycled or disposed of in an environmentally friendly way. We believe that it is important for us to do everything we can to care for the environment and we love initiatives such as Clean Up that try to improve the health of our environment by removing litter from the environment and create awareness of the huge problem we have. Clean Up have compiled some e-waste statistics which are quite alarming such as the 40 million tonnes of e-waste disposed worldwide every year. They also include some ideas on how you can reduce, reuse and recycle your computers, monitors, printers and faxes so that you don’t have to contribute as much to this problem. Whether you have excess e-waste from an office cleanup in the CBD, accumulated old computers at your home in Liverpool, or just have a stack of junk at your home on the North Shore, you need to call Same-Day Rubbish Removal. Computers, faxes, monitors and printers are common items for us to dispose of, but we’ve just about seen everything when it comes to rubbish removal. No matter the size or type of waste disposal job you have, it will be no trouble for our experienced team. We pride ourselves in doing everything we can to make sure we have your place looking spotless before we leave. You don’t even have to do any of the work, just point out what needs to be gone and our friendly team will take it away. For exceptional service, call us now for a free quote on 0402 737 046.